Struggling to grow your marketing agency? Successful agency owners know just having more clients isn't enough — it's having the right clients — those who are easy to manage, pay higher retainers, and who you really love working with. 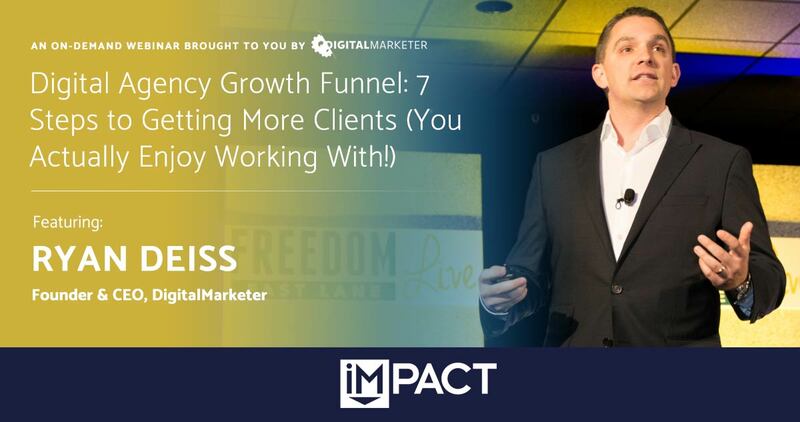 In this on-demand webinar, DigitalMarketer Founder & CEO Ryan Deiss is shares exactly how he and DigitalMarketer built an agency full of happy (and happy to work with) clients and how you can too! This is a can't-miss webinar for agency owners both new and experienced! Use the form below to grab the recording! Fill out the form below to receive the webinar recording and slidedeck.